How do you react when you see a spider? If you’re like many people, you might jump back, stamp your feet erratically, or run for a broom stick or something else to squash the thing. There’s a reason that spiders are the bogeymen of so many horror movies. A lot of people are very frightened of spiders. Fortunately, there isn’t reason to be afraid of most spiders. Other than looking creepy, many spiders are actually harmless. Depending on where you live, you may need to be on the lookout for only one or two venomous spiders. In Mesa, there are two. Hiring an exterminator for regular pest control can help you keep the spiders out of your home, whether they are actually venomous or just hair-raising. Spider control services will get them all. The Black Widow is a common, venomous spider that is found in every state of the United States. It is also one of the most easily identifiable spiders. The Black Widow gets its name from the combination of its look and deadly venom. The spider has a black body with a red mark on its abdomen that looks like an hourglass. However, the males are a little harder to identify since they can be gray or brown, and they can have an hourglass shape that is yellow or white. You’ll run across Black Widow spiders in woodpiles, stone walls, and dark corners of sheds, basements, garages, crawl spaces, and even closets. If you see the distinctive female, beware: The venom is three times as deadly as that of the male. The Brown Recluse is the other venomous spider found in Mesa, though it is not as common as the Black Widow. The Brown Recluse is more common in the middle part of the country, but you can still find them in sheds, garages, basements, and more in Mesa. They also like to hide behind picture frames, behind baseboards, in cardboard boxes and even in dressers. Basically, wherever there is a cool, dark place, you need to be on the look out for these spiders. The Brown Recluse is a light or dark brown spider with long legs. It has a distinctive fiddle-shaped marking on its back. The spider also has six eyes instead of eight. Of course, you’re not likely to notice any of these details when you see one since you’ll just be running away. The Daddy Longlegs is a very common spider, and it is completely benign. You can recognize these spiders by their tiny bodies and their long, thin legs. Basically, they look like beads attached to long strings shaped like legs. You’ll find the Daddy Longlegs spider just about everywhere — window frames, closets, sinks, bath drains, crawl spaces, and basements. The spiders like damp spaces best. Fun fact: The Daddy Longlegs is not technically a spider. It doesn’t have any silk glands to make a web, and it doesn’t have a separate thorax and abdomen. It also has only two eyes. The Jumping Spider may look terrifying — especially if you see it jumping — but it actually completely harmless. This spider is the stuff of your nightmares: It has a large, fuzzy body and a square head with eight, beady little eyes arranged right on top in little clusters. The Jumping Spider is found all over the United States, and it is commonly found in small spaces like the cracks in your floors, the folds of your curtains, and under your furniture. Common in Mesa and the rest of the United States, the Domestic House Spider is dark orange or brown, and it has a faintly spiny appearance. There are dark bands on its legs and a light mark on its breastplate. You can also recognize this spider by its web: It has a distinct funnel shape. You’ll find this spider in the same place you find so many others: Your cabinets, attic, closets, storage rooms and other dark places. These spiders like to be where there isn’t a lot of activity, so you are more likely to find them in the closet in your basement that you never use than your hall closet where you put all your coats. Some spiders can deliver a fatal dose of venom, like the Black Widow and Brown Recluse, but others will just make you sick or give you a serious wound with their bite, like the American House Spider. If you get bitten by one of these spiders, you’ll want to tell your doctor, but you may not need treatment. The American House Spider has a fat body and long legs. The abdomen is dirty white, and the rest of the spider is yellowish brown with dark spots. Some of these spiders also have a black triangular mark in the center of their abdomens. You’ll find these spiders in the upper corners of rooms, the corners of window frames, and dark spaces like attics and crawl spaces. Don’t worry: If you run across one of these spiders, it will pretend to be dead if it feels threatened. It’s not like a snake that will bite you if threatened. While knowledge might be power and help you feel better about your safety when it comes to spiders, it might not make you feel better about having them in your home. 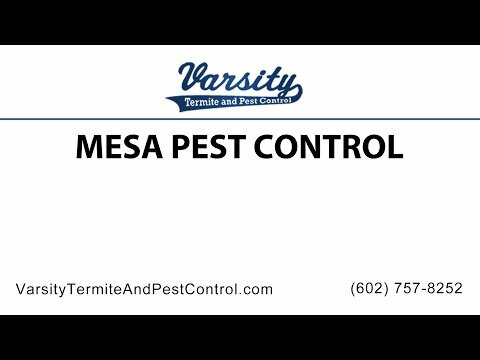 Varsity Termite and Pest Control offers spider control services that will keep your Mesa home spider-free. You don’t have to worry about finding an unexpected surprise when you put on your shoes or you reach for a towel out of the closet. If you have a spider problem, all you have to do is call an exterminator from our team to put your mind at ease.